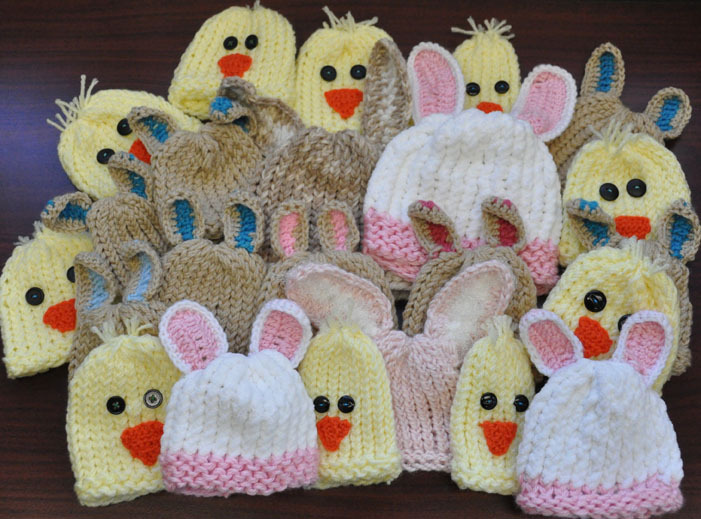 These chick hats are for a special Easter delivery! We love doing these Easter inspired chicks along with the rabbits. 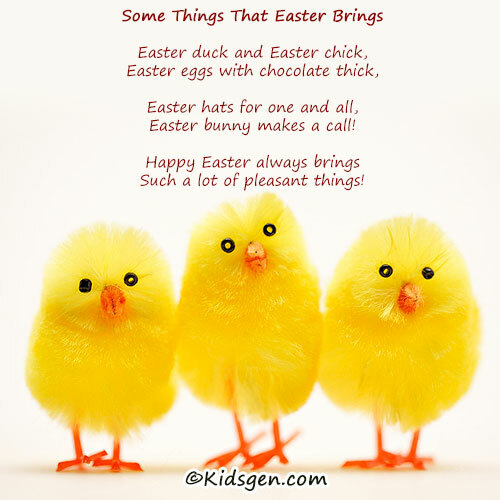 Even if the little ones do not know about Easter yet, it is still a great hat for Spring. We love Spring time when all the flowers are in bloom and the weather brightens up and gets warmer, yet not too warm. It’s a great time to spread rays of sunshine and we look forward to making our next delivery. Easter holds special childhood memories for me, and I made these hats little heads hoping that Easter will also be special for them. This year, the difference is that these hats are all crocheted, not loomed. We are planning a huge delivery this weekend, and these will be part of that delivery. I hope that the recipients of the hats know how much loved they are. We wish you all the wonderful things that Easter brings, including Eternal Hope! I have very fond memories of Easter, spending my Spring Break visiting my grandmother in Ohio. During this season, I remember all the candy molds, in every shape and how we would make our own chocolate bunnies, chicks and crosses. They were so yummy! I hope you have a wonderful time with your loved ones! Hold them extra close! 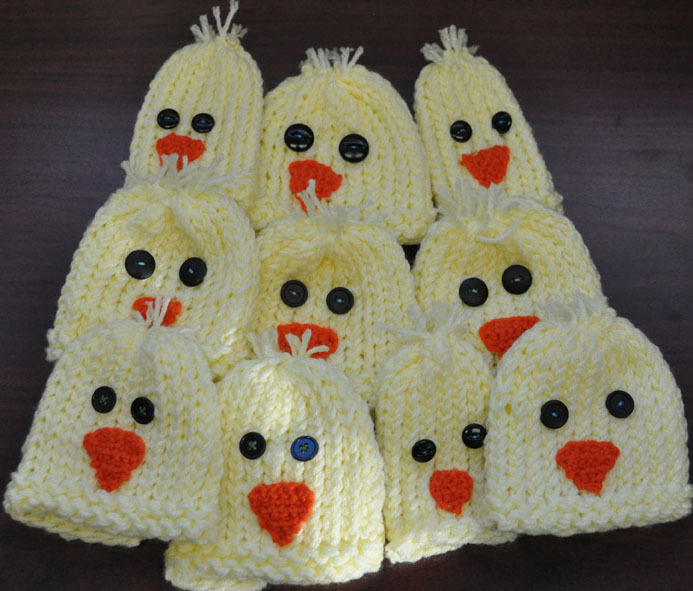 We have made 10 chicks for babies in the NICU to help celebrate their birth during this beautiful Spring season. The baby chicks are all different sizes, some were made on the newborn 24 peg loom, while others were made on the scarf loom using 18 or 16 pegs. We hope to fit all the different sized lil’ peanut heads in the NICU. These hats were truly a team effort, I made the yellow hats in my NICU “standard”, 3 rows of garter stitch for a flexible brim and the rest of the hat is e-wrapped. Vanessa crocheted the orange beaks and sewed the button eyes on. We actually ran out of buttons, so Antoinette graciously purchased more black buttons for these chicks’ eyes. For a finishing touch, I sewed little feathers (yarn strands knotted and cut) on top of their itty bitty heads. And it looks like our Easter Bunnies are multiplying. We now have 2 toddler sized bunny, 1 for a boy and 1 a girl. We have 6 boy bunnies and 5 girl bunnies for babies in the NICU. Here is a shot of our Easter Peeps so far. 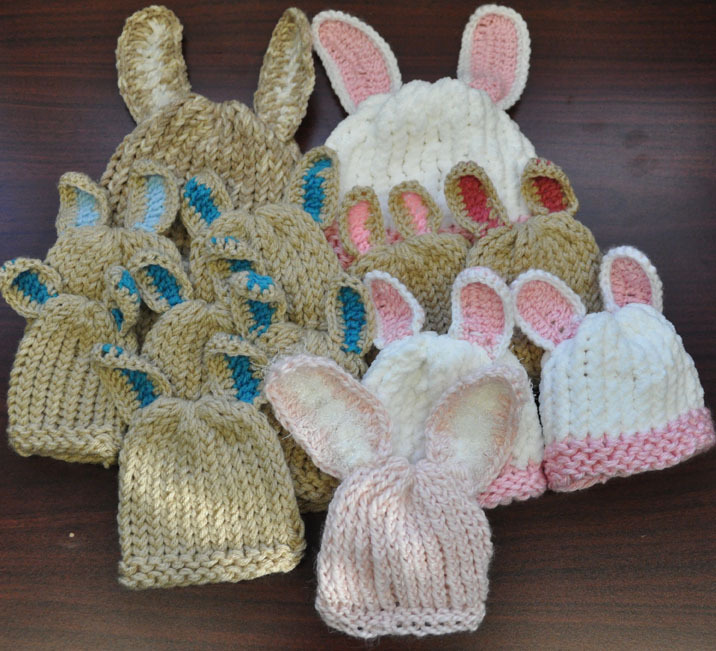 We hope that these hats will delight the children cancer warriors and the families of babies in the NICU to show that there are folks out there that really do care.